The Dog at Pentrich - Derbyshire. You may or may not know that on the 9th, I turned 22! 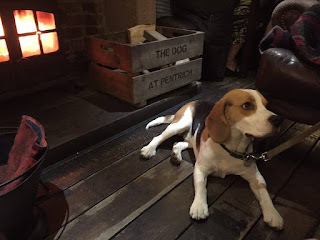 We wanted to go out for a family meal, but it would mean bringing our Beagle Bob along with us, so needed somewhere not too far and doggy friendly. As a group, we decided to head over to The Dog at Pentrich as they allow dogs in the bar area where food is also served. I've always been in two minds as to whether or not I should review this place as I used to work there for two and a half years as a waitress. It's also the place where me and Ashlea met over 4 years ago now, he worked there too as a chef. My mum was also there too at the same time as a duty manager. After speaking to them on Twitter, we headed over about 6pm. Having only recently undergoing a little spruce up, I hadn't seen The Dog since. With a new sign on the wall and a fresh lick of paint, it looked really well presented from the outside. 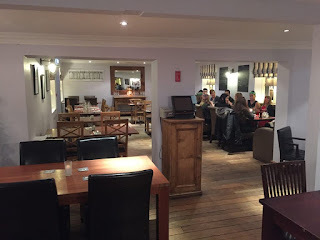 This pub/ restaurant is in a wonderful location in Pentrich. Although it's only a short drive from the likes of Ripley and Swanwick, it feels like you're somewhere far far away in the countryside with great views from the back. We headed through to the bar, ordered some drinks and managed to get seats by the fireplace. It was very busy in the bar area which was great to see, there were no tables free when we arrived but luckily these seats became available shortly after. It was roaring when we got there, so was very welcome on this cold drizzly evening. 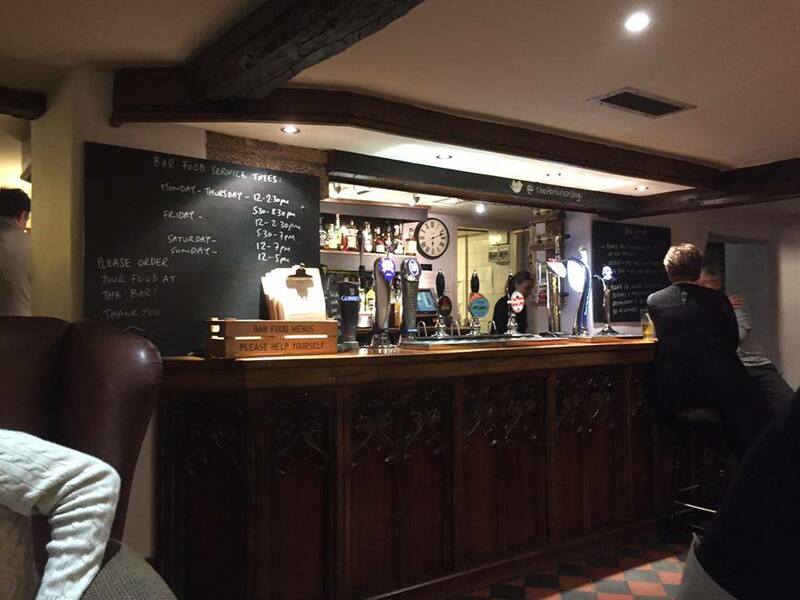 The pub keeps some very traditional features with it's interior with bits like their wooden beams. It is after all, a very old building dating back further than the Pentrich Revolution in 1817. 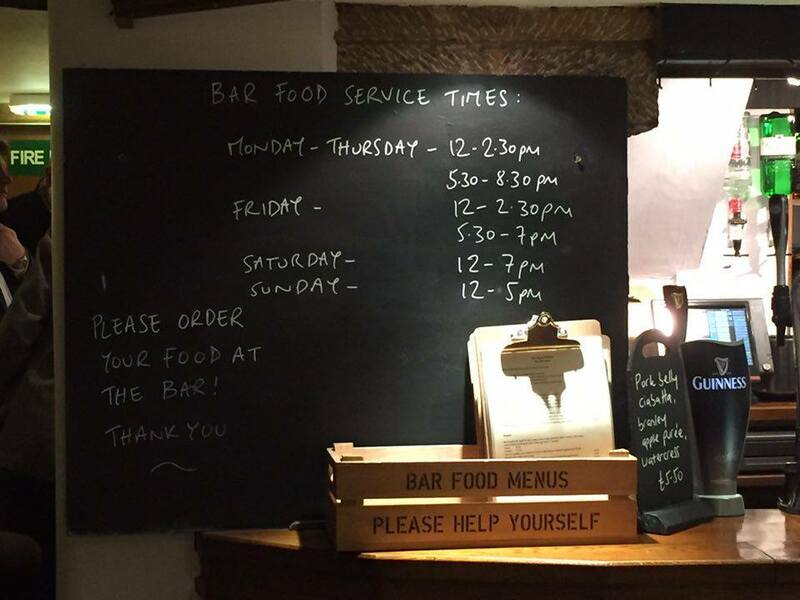 The bar menu's are found on the end of the bar along with their service times along with a daily special board. Once we had all decided what to order, we headed over to the bar. The food came out relatively quickly to say there were a few big parties in the restaurant having christmas meals. Me, my brother Camden and mum's partner Jus went for the handmade burgers. This came with onion rings, BBQ sauce and a choice of either Cheddar or Stilton. 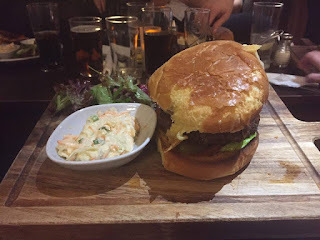 Served in a brioche bun, it was delicious. The burger so juicy and perfectly cooked for me. The cheese was all melted and the combination of flavours was just...yum! Chips are not served with a burger, they are separate, so we ordered a few to share between us. As they are triple cooked they were deliciously crispy with a soft fluffy centre. 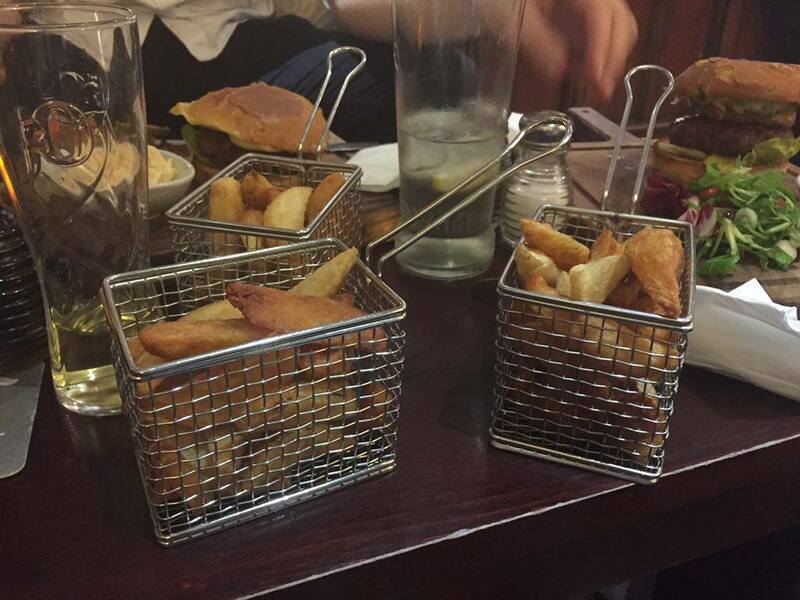 I liked how they were served in a miniature frying basket but be careful, when you add salt it goes everywhere. Ashlea had Beer Battered Codling with the same chips as above and marrowfat mushy peas. It comes served skinless which is exactly what he was wanting. He told me that the fish was so good and the batter was very cripsy. 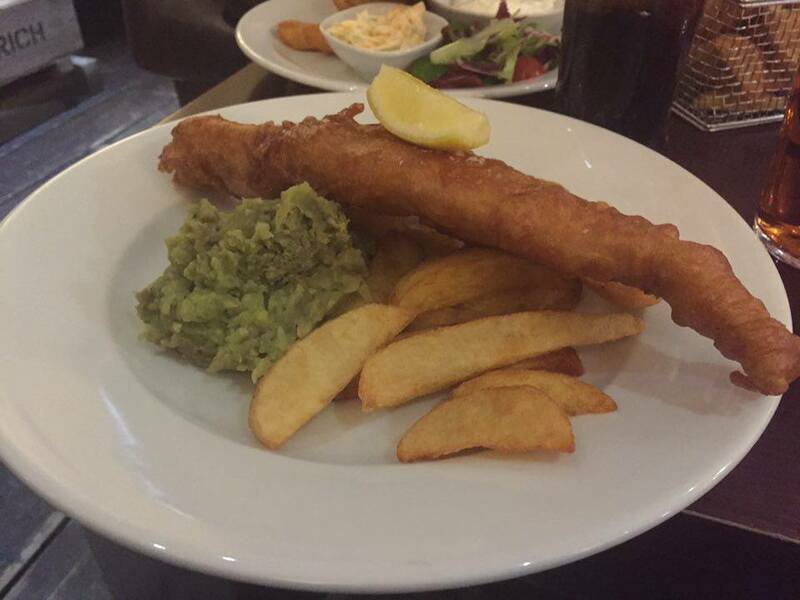 Having never tried mushy peas before, he has now been converted. I had a little sample myself and I too thought they were great. They had a hint of mint in there which really added to the flavours. 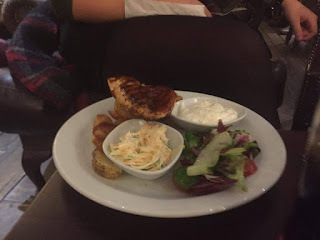 Camden's girlfriend Susannah had the Grilled Chicken Breast in a BBQ sauce with chips again, coleslaw and garlic mayonnaise. Again, another dish that was thoroughly enjoyed. By the end the plate was empty! Need I say any more!? Mum had a Pulled Pork Burger that comes served in BBQ spices, with Applewood Cheese, onion rings and the same brioche bun. I didn't get a picture unfortunately but she loved it! After eating, I had a little wander around to see how things had changed since my last visit. 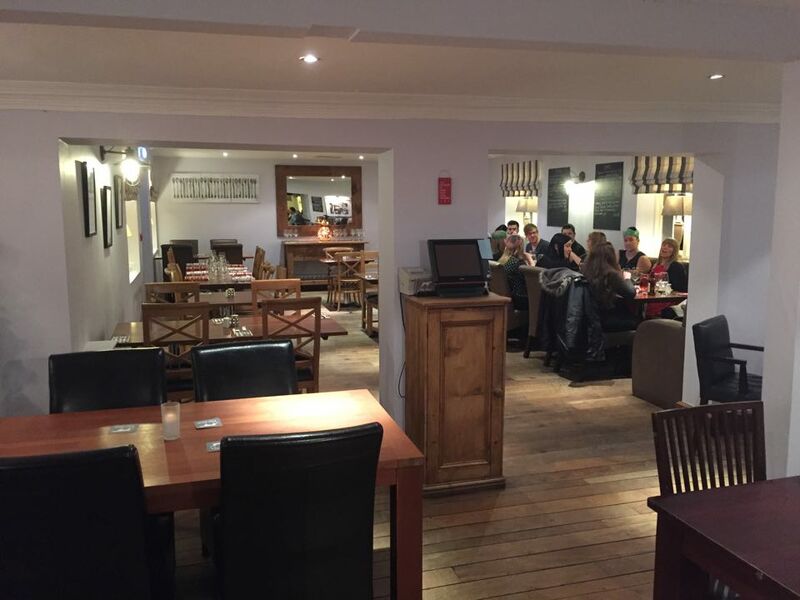 Although the bar area remained quite similar, the biggest changes seemed to be in the restaurant which had been toned down in colour to create a more neutral theme compared to the previous hot pinks with the addition of a little jiggle around with tables and some lovely new wooden furniture. We had a look at desserts. I was far too full but mum and Ashlea wanted to order them. 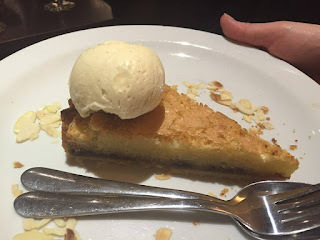 Mum had this warm Bakewell tart with Vanilla pod ice cream. It didn't last long! I had a little try and I thought it was lovely. 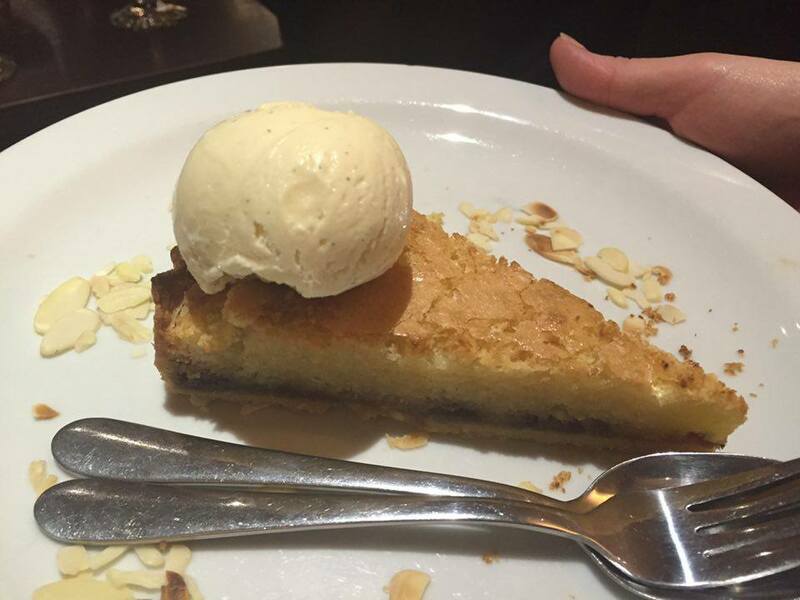 I don't usually like Bakewell tart's but really liked this one! Ashlea had Iced Malteser Parfait with a chocolate sauce and bashed honeycomb. Oh it was so good! 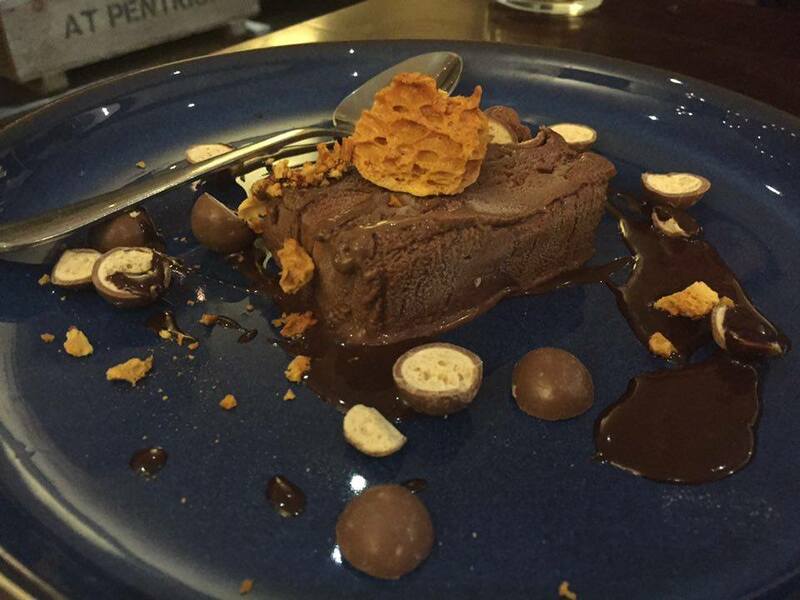 Lovely and rich with the crunch from the honeycomb and maltesers that surrounded it. If I could've handled a dessert, I would have chosen this. 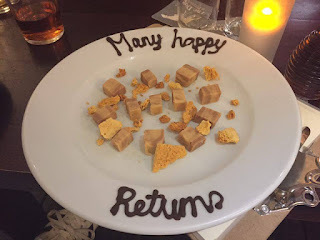 It was so thoughtful and a lovely little surprise to round off a great birthday. 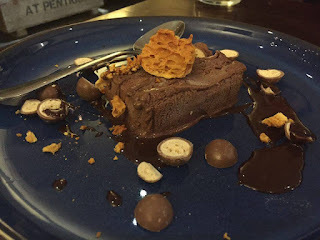 The plate had chunks of fudge on there with some of the bashed honeycomb. Both tasted great, I wasn't sure what flavour the fudge was, but thought maybe salted honeycomb as they both tasted quite similar but it had a salty after taste. We all had a great night at The Dog at Pentrich. It was really nice for us all to go back. The service was great, all of the staff were so friendly and Bob even got some dog biscuits from them. 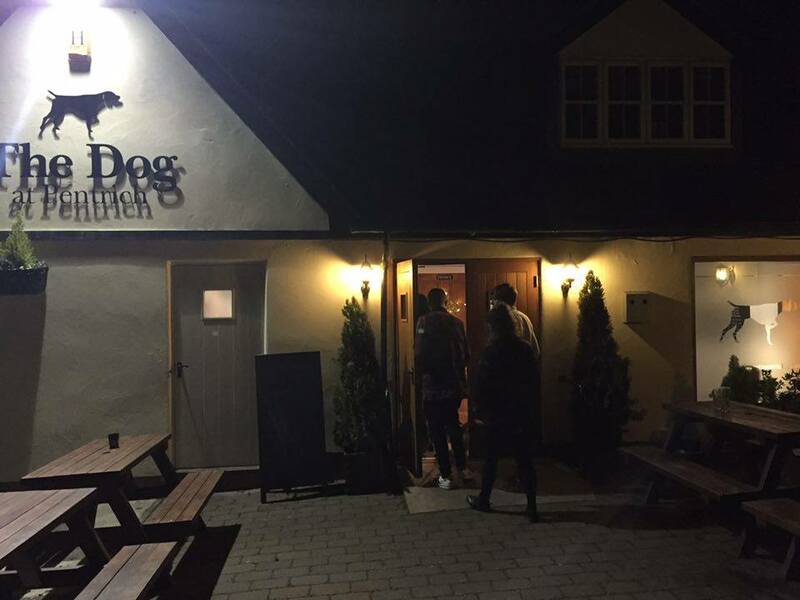 If you're about, then you should definitely try and head over to The Dog, even just for a drink. It's a lovely place to visit in summer too and gets very popular on a warm day.